Playa Del Carmen is an amazing destination in Mexico, in the Quintana Roo state. Located by the sea means you have access to stunning beaches, snorkelling, scuba diving, and much more all the time. It’s also got a fantastic night life and range of bars and restaurants, including the famous Coco Bongo! So, if you want Mexican food with margaritas, and a mariachi band, then head to Playa Del Carmen. The only problem you’ll have choosing somewhere to stay in Playa Del Carmen. Below I discuss the best boutique hotels in Playa Del Carmen for couples. Why boutique hotels you ask? Well, personally I think you get a better experience, and when travelling as a couple, you want service that’s attentive to you and provides you with the best experience, a boutique experience delivers on that each and every time. So, let’s look at the best boutique hotels in Playa Del Carmen for couples. Then afterwards we’ll look at some of the best things to do in Playa Del Carmen with your loved one! Whether it’s a honeymoon, anniversary or simply a holiday for two, we’ve got you covered! This is Bradley and I’s top pick, and for a number of reasons. Not only are you transported to a tranquil jungle oasis in the midst of the chaotic Playa Del Carmen, but you experience sheer luxury for a great price. This 4 star property has everything you need. Rooms are beautifully decorated and you can sense the attention to detail in each element of design. There is an on-site bar offering a range of fantastic food and drinks, including a brilliant happy hour. The Magic Blue Boutique hotel is in a prime location. 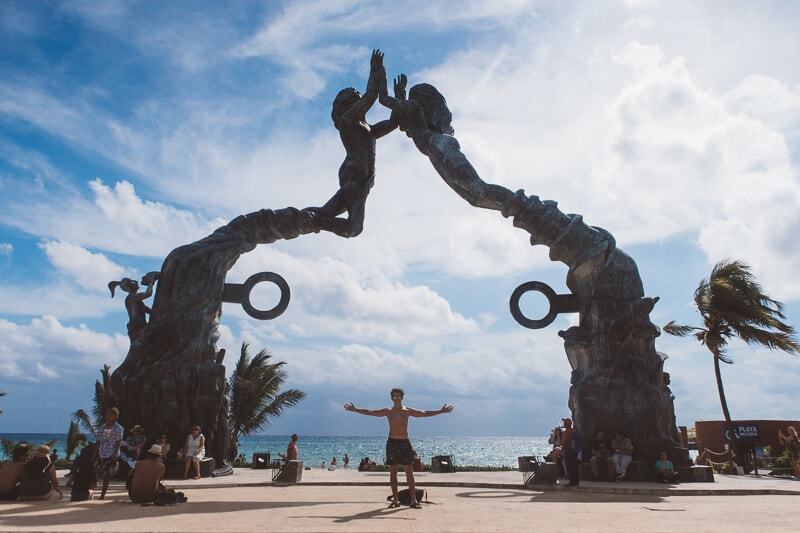 Moments away from the beach and the famous 5th avenue and across the road from the best tourist destination in Playa Del Carmen: Coco Bongo. You can choose from a range of double rooms with private bathrooms, or even a suite with a fantastic bath, balcony and pillow menu. This is truly one of the best boutique hotels in Playa Del Carmen and perfect for couples. The sparkling wine on arrival indicates just how fabulous the rest of your stay will be...trust me! 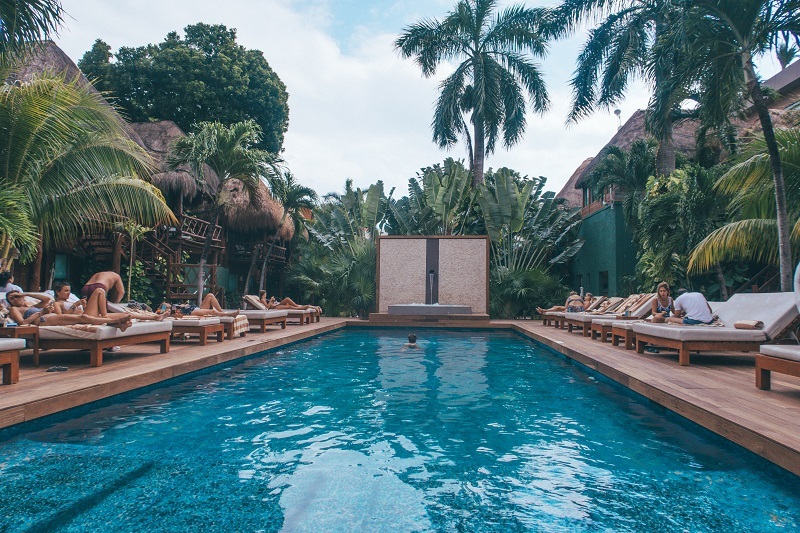 This is one of the best luxury boutique hotels Playa Del Carmen has on offer and you can read about Brad and I's stay here. Prices start at $146 with an amazing breakfast included. This adults only boutique hotel in Playa Del Carmen is perfect for couples looking to escape in their own tranquil dream for a couple of days. 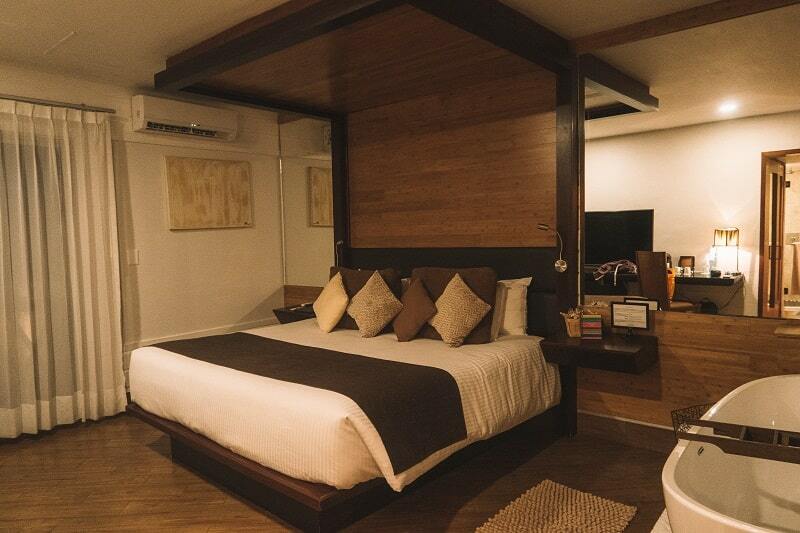 This beautiful 4 star boutique hotel offers elegant rooms with a choice of queen size or king size beds. Tv with cable channels are included. Private bathrooms with marble, shower, free organic amenities are as standard. And you get free WiFi and complimentary water. The rooms are quite beautiful, but the highlight of this properly is the rooftop terrace with a fantastic view over the Mexican Caribbean and a wonderful pool for relaxing. You can even enjoy an on-site massage. Prices start at $70 with breakfast included. This is another one of the beautiful boutique hotels in Playa Del Carmen for couples. It’s a stunning hacienda style and features beautifully styled rooms with a rustic and modern décor, featuring a terrace with pool views. It has a private bathroom with complimentary organic bath amenities, a meditation chaise lounge, and free WifI. The property also features a beautiful outdoor pool (perfect for relaxing after sightseeing) and a tropical garden with furnished terrace. Prices start at $100 per night with a good breakfast included. This is actually an all-inclusive, adults only resort, so it’s a great choice for those couples who are looking to just step back and relax without having to put in any effort! It’s an oasis in the Caribbean and the price tag does reflect it! There are 5 onsite restaurants and your all-inclusive package includes entrance into two beach clubs. The rooms are light, airy and beautifully designed. There is a great swimming pool, and on-site gym and it’s close to the beach. Enjoy exquisite dining, and subtle aromas for those enjoy luxury. This is a beautifully designed boutique hotel in Playa Del Carmen close to the beach and central to all the action. There is a fabulous rooftop pool with panoramic views and lots of sunbeds for tanning and relaxing with a book or a drink. You can also book a room with a fantastic bath for relaxing. Other features include a hot tub and an on-site bar. Prices start at $104 with breakfast included. Last but not least on my list of the best boutique hotels in Playa Del Carmen is the Saint Martin Boutique Hotel. This 3 star property is perfect for couples wanting a more intimate sized property. Rooms are beautifully decorated and come with the usual features: complimentary toiletries, private bathroom, some featuring a bath. Free WiFi is available throughout the property and there is an outdoor swimming pool for relaxing. It’s also close to the beach and beach clubs! I’d say this is one of the best small boutique hotels in Playa Del Carmen. Prices start at $101 with breakfast included. So there you have it, my list of the best boutique hotels in Playa Del Carmen for couples. The reason these properties have made the list is because they are places Bradley and I would actually stay (and have stayed). They all provide everything couples need for a romantic getaway, and it feels like they’ve been designed for two. I hope you can find something that suits you and your loved one in beautiful Playa Del Carmen! Playa Del Carmen is bursting with brilliant things to do. Below I highlight some of my favourites. There are so many brilliant beach clubs in Playa Del Carmen. Actually, if you decide to stay with the Magic Blue Boutique hotel, you get discounts to 4 major beach clubs, which is always useful. Either way, walk along the beach and stop at one that interests you and spend the day drinking cocktails and sunbathing, or swimming in the pool. True relaxation. 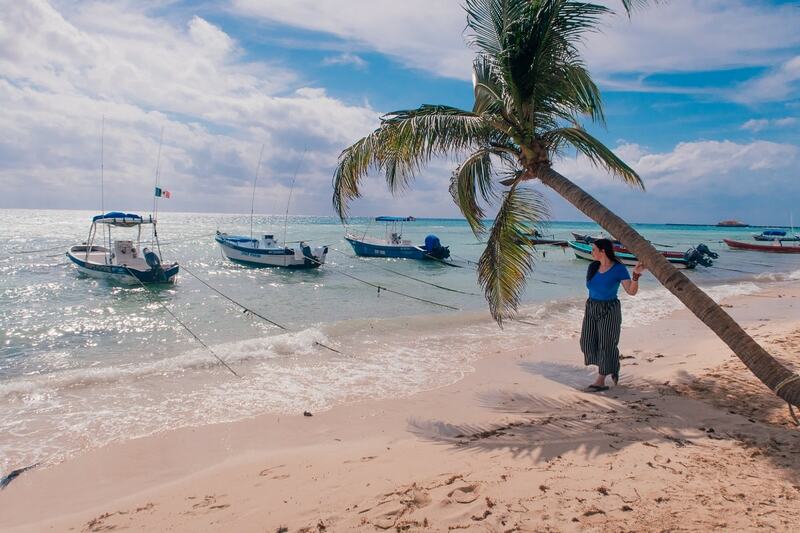 Playa Del Carmen is home to some beautiful beaches, and the opportunity to snorkel. If you love to be in the water, then hop on an organised tour to visit some of the best snorkelling opportunities in the area. Or, rent your own snorkel gear and head out and find fish by yourself if you prefer. If you haven’t watched the Mask, then who even are you!!?? 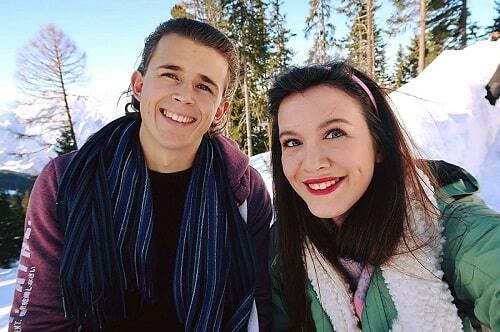 Joking. 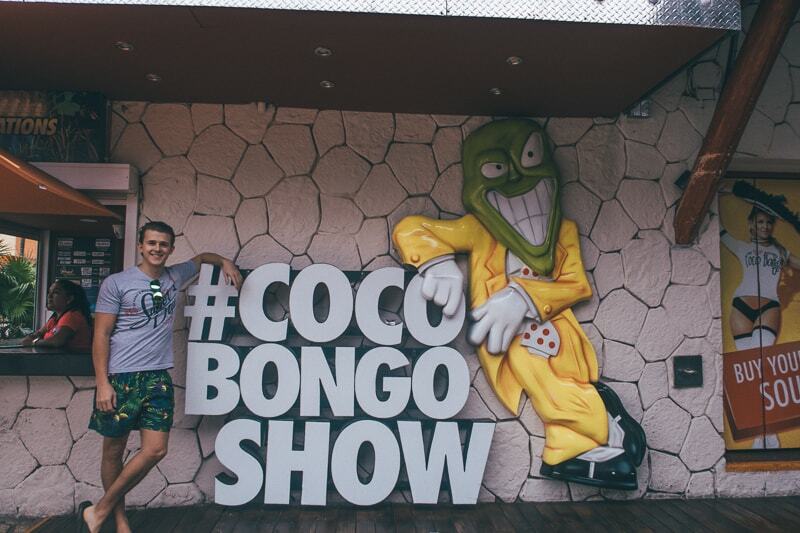 But, CoCo Bongo was a club featured in the hit movie the Mask, starring Jim Carrey and Cameron Diaz. It’s a lot of fun, and after the movie they created an actual CoCo Bongo Club. It starts at 11 and ends around 3 and you get to watch 20 shows consisting of, the Mask, Queen, Michael Jackson and so much more. It’s a set fee in of around $70-100 and this includes all your alcohol, and private waiter service, seats, the more you pay. It’s truly an experience like no other and it’s known to rival the nightlife of Vegas. No trip to Playa Del Carmen would be complete without a visit to Coco Bongo! Okay, so technically this isn’t in Playa Del Carmen, but Tulum (which is also beautiful), but if you’re not staying in Tulum, you should definitely take a trip down to see the ruins. It’s only 40 mins ish on an ADO bus from Playa Del Carmen, and the bus drops you right outside the ruins, so it’s easy to get too. The ruins in Tulum are located on the water and they’re beautiful. There is even a little beach at the ruins with the bluest of water and a perfect place for a dip. It’s cheap too with an entrance fee of around 75 pesos. As you stroll along the beaches in Playa Del Carmen, you’ll see everywhere advertising beach massages, literally on the beach. Talk about relaxation. Imagine a full body massage with the sound of the waves crashing under the hot sun. Bliss. It’s typically around $25-30 dollars per massage, and you often get people doing a deal for couples, x2 for $50. So, if you fancy true pampering on the beach, then get started. So there you have it, my guide to the best boutique hotels in Playa Del Carmen and some top things to do in Playa, so you can sort your itinerary too! How long should I spend in Playa Del Carmen? This totally depends on you as a couple. 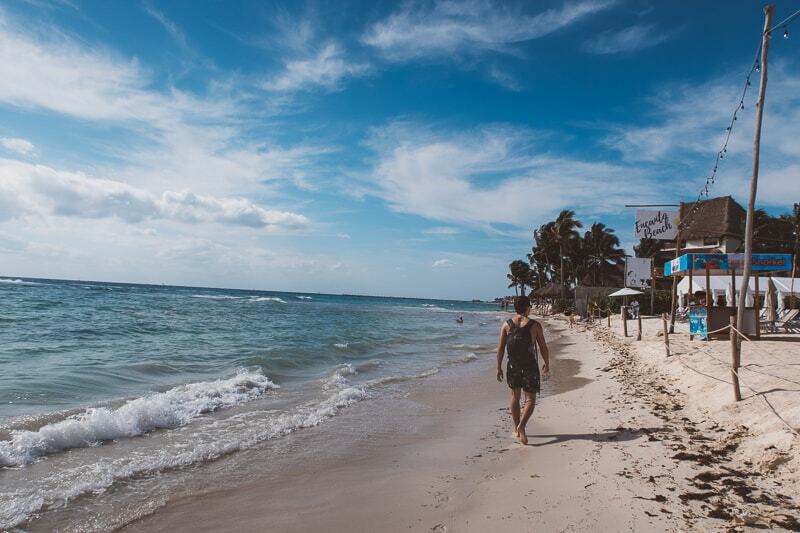 I would recommend a week in Playa Del Carmen if you want the chance to relax, test the nightlife and partake in some activities and day trips. You could easily stretch this to longer, but 1 week is long enough for me in one place. You could also spend 3-4 nights and combine your trip to the coast with a stay in Cancun itself or Tulum. This way you get to experience lots of different beaches. So there you have it, my guide to the best boutique hotels in Playa Del Carmen for couples, and some extra information to help plan your trip to Playa Del Carmen perfectly. If none of these Playa Del Carmen boutique hotels take your fancy, then you can check out other accommodation in Playa Del Carmen here!